Indira Nathan, Research Fellow at University College London, presented a research poster at the European Crohn’s and Colitis Conference in Vienna, in February 2013. 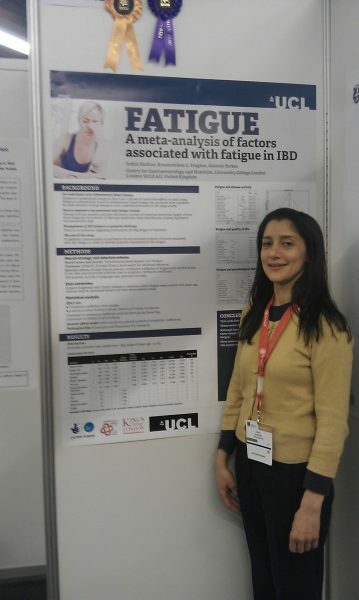 The poster refers to a meta-analysis of factors linked to fatigue in inflammatory bowel disease. Researchers often design studies which ask the same question, the results of these studies may be conflicting which can make it difficult to determine the answer. A meta-analysis can help with this. It is a statistical method used to weigh up the findings of studies which ask a similar question; the result is an overall evidence-based answer. The aim of the meta-analysis presented was to examine the “picture of IBD fatigue”. This is based only on the results of available published studies that have investigated whether there is a link (or correlation) between fatigue and another factor. A clear message from the results was that as fatigue increased, quality of life for patients with IBD decreased. Both “disease related factors” such as disease activity and anaemia, and “cognitive factors”, including psychological distress were significantly correlated with fatigue. As far as we are aware, this is the first meta-analysis to examine factors associated with IBD fatigue. It is difficult to draw any firm conclusions about treatment from this particular study (our work on interventions and an MOT checklist will look more specifically at ways of managing fatigue) but it does clearly highlight the multidimensional nature of IBD fatigue and its impact on quality of life. The poster attracted significant interest from the health care professionals at the conference, further helping to raise awareness of the issue.